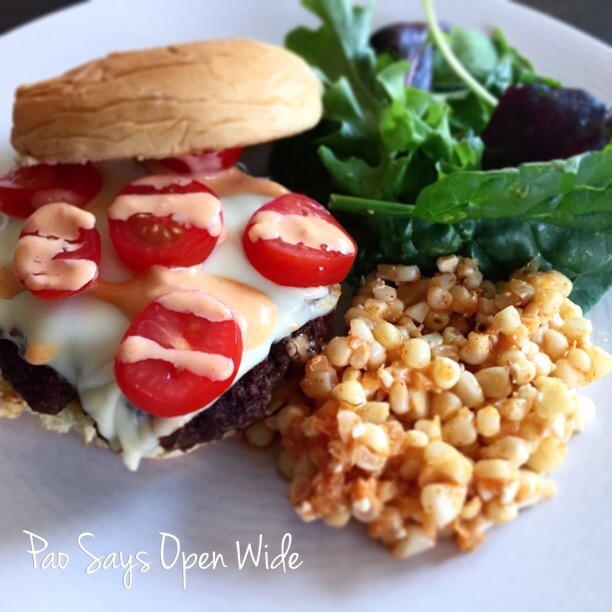 Red White and Boom: The Perfect 4th of July Menu – Pao Says, "Open Wide!" Note** what makes a burger is the quality of meat ou make it with. Now, trust me, I’m not advocating you go spend $50 on a few lbs of ground beef, but look around at your local butcher’s shop. Ground beef is typically pretty cheap, even if it’s “the good stuff”. We got ours from Harvey’s Market at Union Market at just $6.99 a lb… That’s like $1 more expensive than something I’d find shrink-wrapped at the grocery store. Trust me, it’s definitely worth it to get some fresh and awesome ground beef for this recipe … Otherwise, it’ll just be another burger. Toss the meat and all the seasonings and soy sauce in a bowl together. Using your hands, incorporate all the ingredients together being careful not to overmix or squeeze the meat- that could produce a really dense burger instead of the light and juicy texture you want! Once the ingredients are mixed together, lightly form patties with a slight indentation in the center (can be made by pressing your thumb into center). The small indentation will help the burgers cook evenly. This may sound nerdy, but they should look something like a red blood cell in shape. Toast up the buns on the grill or on your skillet. Smear some sauce on the bottom of the burger patty, place it on the toasted bun, top the patties with some chopped tomatoes, and then serve! Combine all ingredients. Change your friends’ lives with this heavenly SAWSE. Boil your corn for 5 minutes in salted water with a splash of milk. Take it out and pat dry. Brush the corn with olive oil to coat. Grill the corn, turning every few minutes, until you get some charred bits and the corn is juicy and cooked (about 8-10 minutes). If you don’t have a grill, you can do this in a hot cast iron skillet or in a grill pan. As your corn grills, put together your spicy dressing: lime juice, paprika(s), and salt- combined in a bowl. Once your corn is cooked, slice it off of the cob. You do this by standing the corn up on the flat bottom, and sliding your knife down the length of it to cut off the kernels. It’ll be hot, so hold the top with a paper towel. Once you’ve cut all your kernels off your corn, place the corn in a bowl and melt in the butter. Add in the dressing and the feta. Mix it all up, and it’s ready to serve!